For example - I seriously watched season 1 and 2 of Flavor of Love. 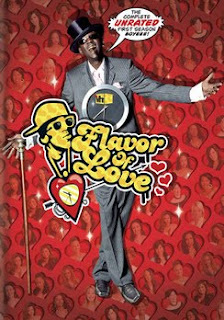 And then, to make matters worse, I watched the spin off of Flavor of Love, I Love New York. I only watched the first season of this, but I think that is bad enough. I just don't understand why I was so addicted to these horrible shows!! Oh wait...it gets worse! I even watched Season 1 and 2 of A Shot at Love with Tila Tequila! "HEY GIRL HEY!" I really guess it all started with shows like The Real World and then Road Rules. For a while I was super obsessed with watching all of the challenges. I haven't seen any in quite a few seasons, but if I stumbled across a marathon one day, I'm sure I'd plop right down and waste a whole day watching. I am now watching the Bad Girls reuinon show and that is was made all these thoughts pop into my head. And I'll probably watch their new show Love Games, with 3 of the former bad girls. Ahhh, I'm so embarassed! Please tell me there are others out there with this embarrassing obsession! I obviously can't be the only one since these shows go on and on for season after season! !